For decades, the public has sympathized more with Israel than the Palestinians in the Middle East conflict. However, the partisan gap in sympathies, while little changed in recent years, is as large as it has been in more than three decades of polling. Discussion of the U.S.-Israeli relationship is likely to come to the fore with the nomination of former Nebraska senator Chuck Hagel as President Obama’s new secretary of defense. The choice of Hagel has drawn criticism from some of his former Republican colleagues on Capitol Hill, who have questioned whether he has been supportive enough of Israel. In a Pew Research Center survey conducted last month (Dec. 5-9), 50% of adults said they sympathized more with Israel in its dispute with the Palestinians. Just 10% sympathized more with the Palestinians, while about as many (13%) volunteered that they sympathized with neither side. Attitudes toward Israel and the Palestinians have become more divided along partisan lines: In December, 70% of Republicans sympathized with more Israel, while just 2% sympathized more with the Palestinians and 7% said they sympathized with neither side. About four-in-ten Democrats (41%) sympathized more with Israel and 13% sympathized with the Palestinians. Democrats were more likely than Republicans to volunteer that they sympathized with neither side in the conflict (15% vs. 7% of Republicans) and to offer no opinion (27% vs. 18%). The 29-point partisan gap in the percentages sympathizing more with Israel is about the same as it has been in recent years. But differences were more modest a decade ago, and in 1978, shortly after the Israel-Egypt peace agreement, the gap was just five points. The differences have widened as Republican support for Israel has grown and Democratic opinion has been more stable. 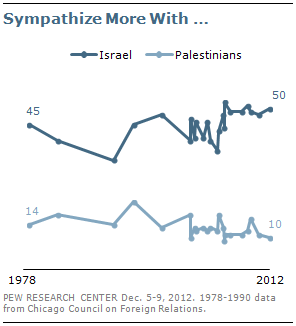 In December, 70% of Republicans sympathized more with Israel, compared with 56% in 2002 and 49% in 1978. Among Democrats, the most recent measure (41%) was little different from the percentage of Democrats who sympathized more with Israel in 2002 (37%) and 1978 (44%). 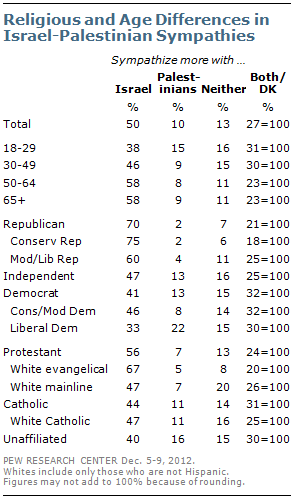 Aside from the partisan gap in Mideast sympathies, there also are religious and age differences in these opinions. As in recent years, the December 2012 survey found that white evangelical Protestants were far more likely to sympathize more with Israel than were members of other religious groups. Fully 67% of white evangelical Protestants said they sympathized more with Israel than the Palestinians. By contrast, only about half of white mainline Protestants and white Catholics (47% each) sympathized more with Israel. Among the religiously unaffiliated, 40% said their sympathies were more with Israel than the Palestinians. Majorities of those 65 and older (58%) and those 50 to 64 (also 58%), sympathized more with Israel, compared with just 38% of those younger than 30. 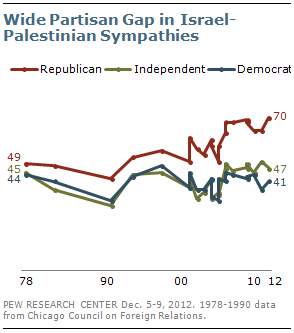 While there was a sizable partisan gap in Middle East sympathies, both parties were also internally divided. Three-quarters of conservative Republicans (75%) sympathized more with Israel, compared with 60% of moderate and liberal Republicans. Among Democrats, 46% of the party’s conservatives and moderates said they sympathized more with Israel, compared with 33% of liberals. Conservative Republicans also stand out for their belief that the United States has not been supportive enough of Israel. 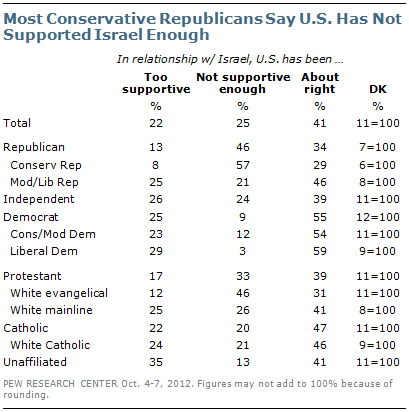 In a survey last October, fully 57% of conservative Republicans said the U.S. has not been supportive enough of Israel. Across other political groups, majorities or pluralities said U.S. support for Israel was about right. Among moderate and liberal Republicans, 46% said U.S. support for Israel was about right; just 21% viewed it as inadequate – less than half the percentage among conservative Republicans. Nearly half of white evangelical Protestants (46%) said that the United States had done too little to support Israel, by far the highest percentage of any religious group. No more than about a quarter in other religious groups said the United States was not supportive enough of Israel. “Israel Support Unchanged in Wake of Gaza Conflict,” Dec. 14, 2012. “Americans on Middle East Turmoil: Keep Us Out of It,” Dec. 14, 2012. “On Eve of Foreign Debate, Growing Pessimism about Arab Spring Aftermath,” Oct. 18, 2012. “A Global ‘No’ to a Nuclear-Armed Iran, May 18, 2012. “Ideological Gaps over Israel on Both Sides of the Atlantic,” Jan. 29, 2009. “A Six-Day War: Its Aftermath in American Public Opinion,” May 30, 2007.